I just had a marvelous phone call with a returning customer who buys a holiday lap quilt from us every year for her holiday decorating. She has a two-story entrance to her home and uses the holiday lap quilts to easily set the tone for her holiday parties. She is having a number of young grand children visiting this year so we laughed about what was ahead - kids getting into presents early, cookie decorating with more icing on the kids than the cookies, reading Christmas stories at bedtime. Considering what she has planned, it was easy to recommend a holiday lap quilt for her, our Reindeer Fun Lap Quilt. The 50x60-inch standard lap quilt features reindeer also getting into holiday antics, a perfect reflection of what she has to look forward to with all of the visiting relatives. 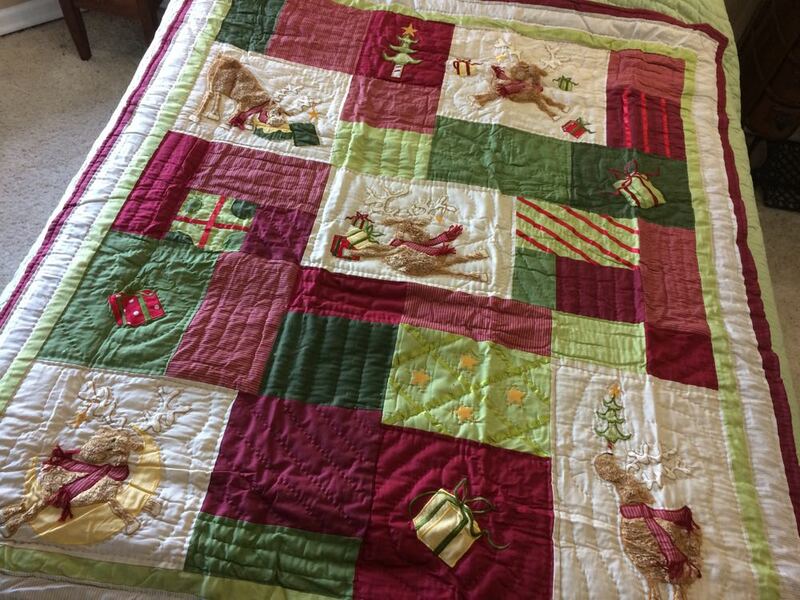 She also wanted a holiday lap quilt with burgundy colors instead of tomato red and Reindeer Fun Lap Quilt includes those colors as well as traditional Christmas green and even a touch of contemporary lime. Or should I call it chartreuse! I may still have a box of stuffed reindeer toy ornaments I will include so her grandchildren can add their names to the ornament before hanging it on the Christmas tree. She said she expects a few may adopt the reindeer toy and that’s fine, too, I’m sure the reindeer ornaments won’t mind!